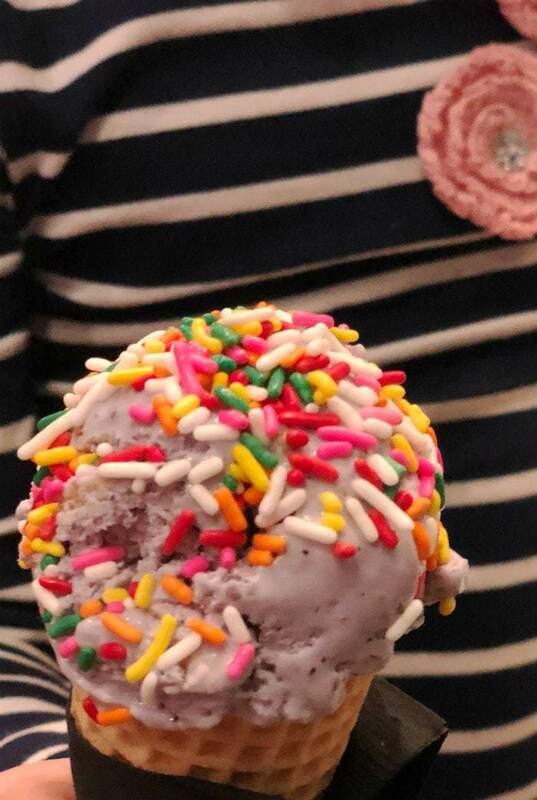 Finding the perfect family restaurant is kind of like dating- and I’ll admit to being a bit of a prude. I don’t like one night stands- I want a long-term relationship. And I’ve just found the perfect partner in 5280 Burger Bar. Last Tuesday I had about had it with the kitchen. I’d spent all weekend prepping food, grocery shopping, and dreaming of a beach vacation. And yet somehow, in a span of 48 hours, the food I had prepped had disappeared. And the thought of researching a recipe, heading back to the grocery store and then cooking was making me nauseous. So which was worse? Cooking or going out? ???? 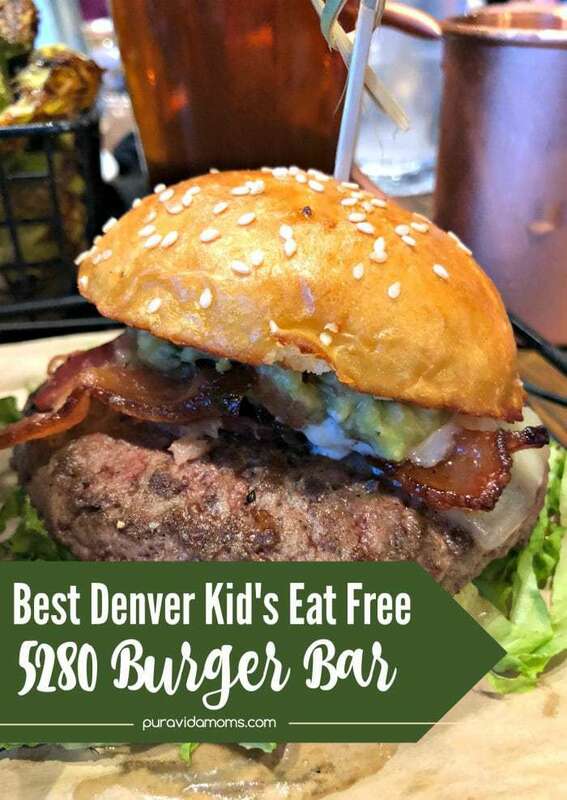 I decided on the path of least resistance- the husband can drive the car while I scroll through social media, the kids listen to the Coco soundtrack and we head over to the 5280 Burger Bar. It was the best first date from a restaurant ever! On a first date, we have to get right to the small talk. Which at 5280 Burger Bar is Happy Hour. It’s normally Monday- Friday from 2-6 pm, but since we arrived right at 5 pm we had to get to the point. Aside from all kinds of awesome drink specials (hello $5 Moscow Mules! ), the food choices are great too. Sliders, street tacos, chips and queso, pretzels, wings, and even a cheeseburger eggroll. I’m a package deal- I come with husband and two kids in tow. If a restaurant can’t handle that, it’s a total deal breaker. Have you ever packed up the whole family for Kid’s Eat Free night somewhere, only to arrive at the restaurant and get the worst side eye ever from the employees? You know what I’m talking about- like everyone is grinning and bearing it for the one night a week they have to put up with littles in their space? The hostesses talked to my girls- asked their names, ages, favorite colors, everything. Yep. Everyone was NICE to our kids. Like super nice! 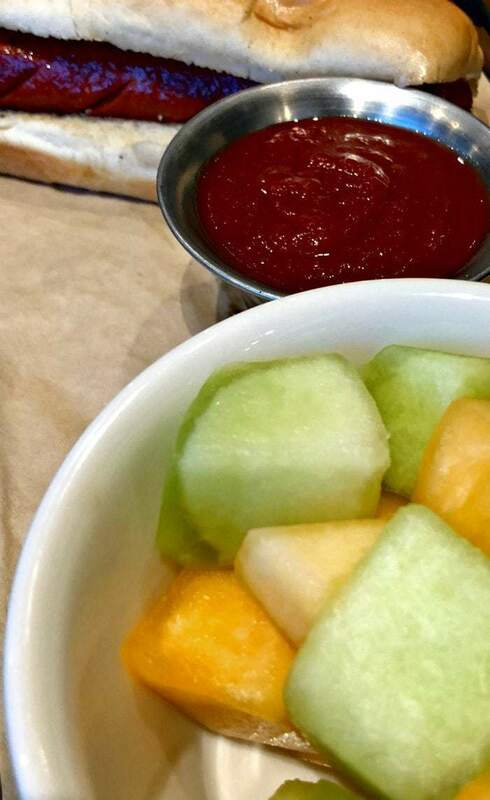 Plus the Kid’s Meal had a variety of delicious food choices that were healthy- each girl ate a huge bowl of fresh cut fruit. 5280 Burger Bar met the fam! And they loved each other. A good relationship means answering the tough questions even when it’s uncomfortable. For me, that means- are you going to support my healthy eating habits? In all seriousness though, I’ve been making a huge effort to eat more vegetables and lean protein, and my waistline is so proud of me. 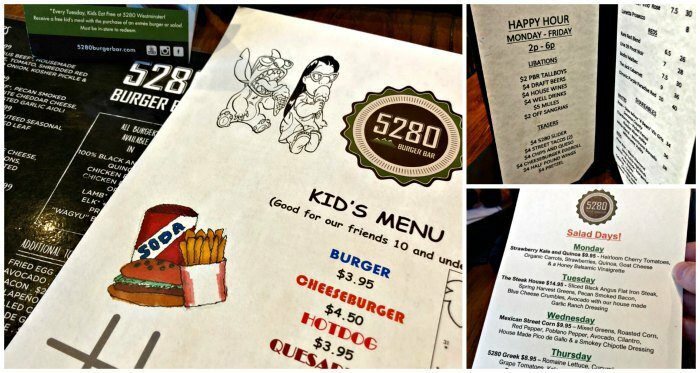 So I was thrilled to see the Salad Days menu from 5280 Burger Bar. Each day from Monday to Friday, the 5280 Burger Bar features a different house-made salad full of delicious and healthy ingredients locally sourced. And, all the dressings are made in-house. I had the Champagne Vinaigrette with my salad and it was to die for. Another check in the long-term relationship column! First Date Part 4: When Can I See You Again? The euphoria of first love- you know what I’m talking about. When you just can’t get enough of the new person. This often makes people a bit crazy- and 5280 Burger Bar totally did this to me. You guys- there is an “I Can’t Decide” item on the menu. It makes the relationship possibilities with 5280 Burger Bar almost endless. Here’s how it works: you choose two burgers, or a salad and a burger from the regular menu. And you get small sized portions of each item for the same price as the full sized menu item. Naturally, I ordered What the Guac? 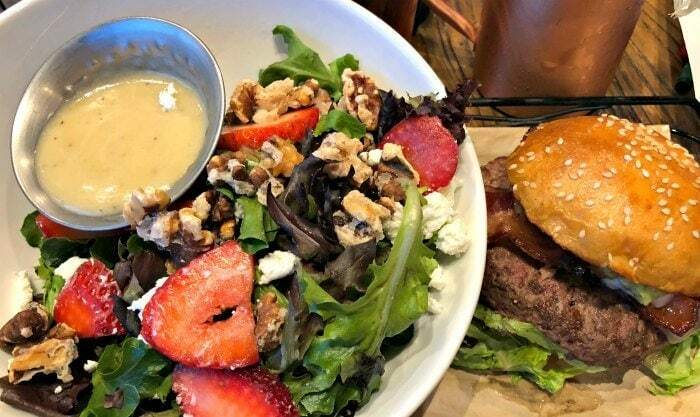 burger and the Strawberry Fields salad. The burger came on a fresh potato bun baked in-house, with guacamole, bacon, and house-made garlic aioli. And the salad! Did someone say goat cheese? The greens were perfectly crisp and fresh, the strawberries red, juicy, and abundant, and the Champagne Vinaigrette was out of this world. I am already dreaming of the next visit when I can try the New Mexican Green Chile Burger. And the visit after that when I can try The Perfect Burger. And the visit after that when I can try the… well, you get the idea. You’ll just have to stay tuned for a second date recap. In the meantime, fall in love with them yourself! With two locations- Downtown Denver and Westminster, there’s really no reason not to. Make sure to visit their website with updated menu info, and tag them and us on social media shares! 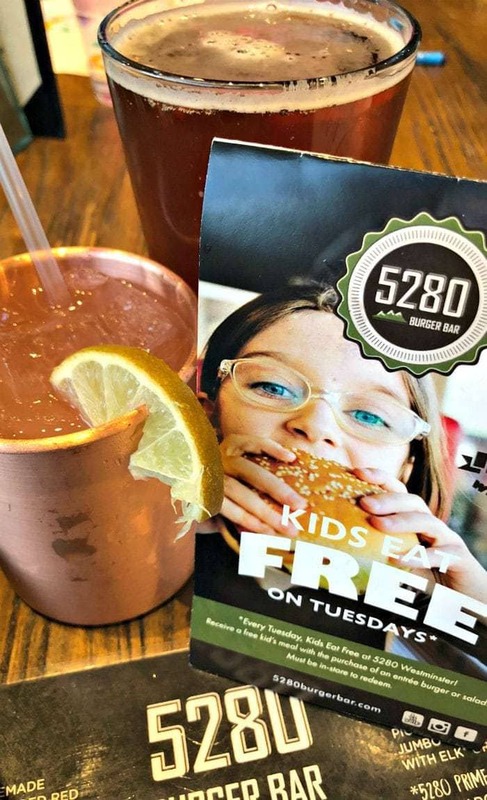 I just can’t wait to take my granddaughters to 5280 Burger Bar!